This month’s football food spotlight is shining on two classic dude-approved foods: pizza and wings! Anytime my bunch gets together to watch the Texans play, there’s going to be food involved…and pizza and wings are two of the most-requested menu items. That said, I want to be watching the game too…not in the kitchen rolling out dough and frying up chicken wings. That’s where convenient takeout and delivery options come in. It's one of secret weapons to ensure everyone is properly fed without messing up my kitchen or making me miss any of the big plays! Earlier this month, we teamed up with Papa John’s and Buffalo Wild Wings to set up the ultimate dude-approved pizza and wing menu. I call this casual menu my No Forks Feast, because everything served is eaten out of hand on paper plates! 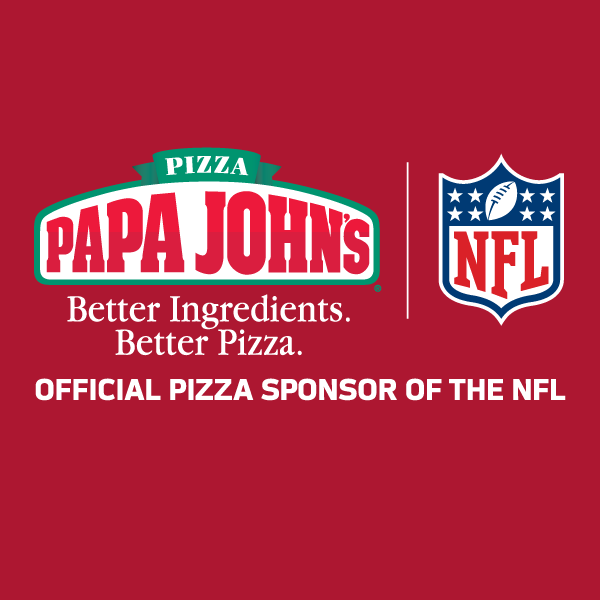 Papa John’s is an Official Pizza Sponsor of the National Football League. 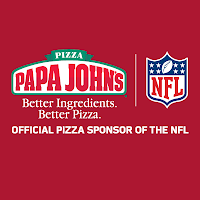 They delivered hot, freshly baked pizzas to the front door just ahead of kickoff for a Sunday night game. We ordered a Tuscan Cheese pizza for the vegetarians and All The Meats pizzas for the carnivores. The name is appropriate, because this pizza is topped with a generous amount of pepperoni, Italian sausage, beef, bacon and Canadian Bacon. The pizzas arrived piping hot with tons of melted cheese. Papa John's also sent along one of their new pizza-shaped chocolate chip cookies for us to try. The cookie came sliced just like a little pizza and was buttery and golden. It was crispy on the outside, chewy in the middle, and full of melted semisweet chocolate chips. 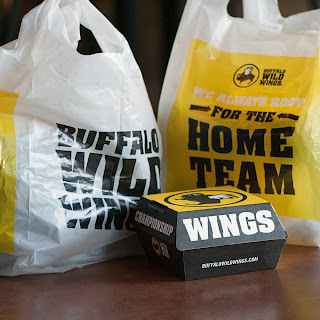 We also ordered a six-flavor wing platter from the Buffalo Wild Wings takeout menu, and the entire ordering and pickup process was so simple! We called our order in the day before the game and made arrangements to pick up a combination of traditional and boneless wings about 30 minutes before game time. The entire process was seamless, and everything was neatly packed up and ready to go when we arrived. All I had to do to set the wings up for everyone was open the individual boxes of wings and arrange a platter of blue cheese, ranch, and carrots & celery sticks nearby for everyone to enjoy. They even accommodated our special request for all drums on our traditional wings! The boneless wings are two-bite breaded chicken breast pieces tossed in one of Buffalo Wild Wings' signature sauces. They're ideal for people who don't like to fuss with bones. We also tried sauces and dry rubs so we could experience each serving option that is offered. Since I didn’t have to deal with cooking the main dishes for this party, it allowed me to focus my attention on a homemade appetizer and dessert. Since my goal was to make gameday as stress-free as possible for myself, I made one of my favorite dips and some of my addictive Spicy Nutty Maple-Bacon Caramel Corn the day before the game. Both are absolutely perfect for this No Forks Feast since they can be enjoyed "by hand." One of my most-requested recipes to take to parties is my chunky Two-Step Greek Ranch Dip. It’s super easy to make and pairs really well with the pizza and wings. It combines my love of ranch dip with some of my favorite Greek-inspired ingredients and is served with crispy pita chips. Everyone who tries this dip goes nuts for it, so I'm happy to share the recipe with you again today. Step 1: Add all of the ingredients to a large mixing bowl. Stir until evenly combined and all of the dip mix has been dissolved into the mixture. Spoon into a serving bowl. Step 2: Cover the bowl with plastic wrap and refrigerate for at least two hours so the flavors can combine. Overnight works fine too! Serve with pita chips or warmed pita bread cut into triangles. This dip is crazy good and full of great flavors and textures. It's a great addition to a gameday menu or any upcoming holiday parties where you want to take something a little bit different than the usual ranch dip. I hope you’ll serve up my no-stress No Forks Feast for one of your upcoming gameday menus…just make sure to have plenty of napkins and wet-wipes on hand so everyone can keep those hands – and your furniture – clean. Be sure to come here in November for a Lightened Up Football Feast…it’s lighter on calories and fat, but it doesn’t sacrifice flavor one bit! With lots of indulging on the horizon for holiday parties in December, this menu is one your guests will really appreciate! Disclosure: Papa John’s provided pizza and a chocolate chip cookie, and Buffalo Wild Wings provided a wing platter to facilitate inclusion in this article. I received no further compensation, and all opinions expressed are my own.